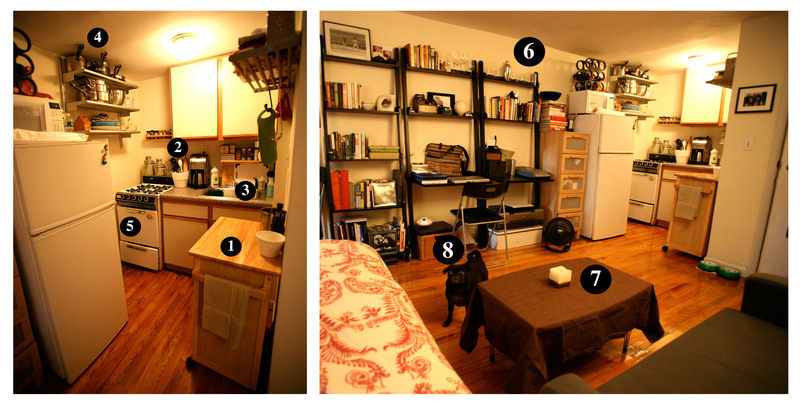 So here it is folks: the actual Kitchenette where all the meals on Kitchenette Foodie are created (and a glimpse of my whole apartment actually, just so you can understand what small space living really means!). I realized that I started this blog with the intention of offering advice on cooking in tiny areas, and yet I haven’t really mentioned it at all yet. I’ve been distracted by the actual food… so this whole post will be dedicated to just that. 1. If you have no counter space, invest in a rolling kitchen cart. Mine serves as counter space as well as for storage. It has a cabinet with two shelves and a drawer – the ONLY drawer in the kitchen. I ordered mine online for about $90 and assembled it myself (not expertly, I might add – after about a month of fighting with my shoddily assembled drawer every time he tried to find a fork, my boyfriend took it apart and reassembled it). 2. When you have no drawers, nice bowls are your best friend. My silverware lives in my one rolling cart drawer, and all other kitchen utensils are kept in my lovely Crate & Barrel popcorn bowls (table centerpieces from my friend Katie’s wedding in 2005). 3. Constant cleanup. Cooking generates a lot of dishes – even before you sit down to actually eat. In a small space like this, washing, drying, and putting away equipment as you go is essential. Otherwise you’ll end up unable to even see your sink. I use a wire rack (meant for cooling baked goods) over a dish towel when I air dry. 4. Use your vertical space. As you can see, I have pots and pans stacked until they touch the ceiling. Ikea shelves are great for small kitchens, and cheap! (I did hit my head once or twice while standing at the stove, before I got used to them). I’d like to say I installed these myself (I do own a drill and like using it! ), but I’m 5’3. Sometimes you just have to let a tall man help. And pay him in beer. 5. An oven isn’t just an oven; it’s a cabinet. You can’t tell, but my oven contains a cookie sheet, a cast iron grill pan, and two pyrex baking dishes. There’s no shame in using your oven for storage – just don’t forget to take everything out before you preheat the oven. Just in case I’m forgetful, I never store anything melt-able, like plastic, in my oven. 6. Your kitchen can trickle into your living room, especially if there are no walls or doors. I have more kitchen items than anything else (I think when I moved, 70% of the boxes were labeled “Kitchen”). I keep cookbooks and salad bowls on top of my dresser drawers, and wine glasses, champagne glasses, cocktail shakers, smaller cookbooks, and a seltzer maker on my bookshelves. If you act like it’s a planned component of your decor, it works. 7. Coffee tables double as chopping blocks. When I’m preparing a multi-course meal or have lots going on in the kitchen, I bring my cutting boards over to the coffee table and chop there. For certain tasks, I even prefer the coffee table. It’s the best place to use a citrus juicer because it’s low down and I can get more leverage. Plus, it’s nice to sit down and relax while chopping or peeling vegetables sometimes. Just don’t get distracted. Last November, the combination of a very sharp Japanese chef’s knife, rock-hard raw butternut squash, and watching old Arrested Development episodes on Netflix almost cost me a fingertip! 8. This isn’t really a tip, but if you have a canine sous-chef like mine, who likes to be underneath you at all times, don’t forget to check their head and back after you’re done cooking. Eloise usually has a sprinkling of whatever I’ve dropped on the floor all over her. And picking garlic out of dog fur is much harder once it dries. This entry was posted in Tips and tagged cooking tips, kitchen, kitchenette, space. Bookmark the permalink. Nice work! My Tokyo kitchen is just a sink and a stove (no oven), so I’m going to steal some of your ideas. Notably, coffee table as chopping block and rolling cart – I have ZERO counter space. I’ll be honest with myself and not even pretend that I’ll do dishes before (or after) I eat. Thanks! Check out my mom's eco-friendly caviar business - and maybe buy some! Pointy Snout Caviar is made by hand from sustainably farmed White Sturgeon roe. It is chemical-free and honestly labeled for date of harvest and provenance.